Do you love candles as much as I do? Of course you do! Do you want to know what I love best about a candle? The jar. Yup, its' true. That glass jar that houses that awesome smelling candle you burn daily can be useful even after all your wax melts! Pretty cool, huh? 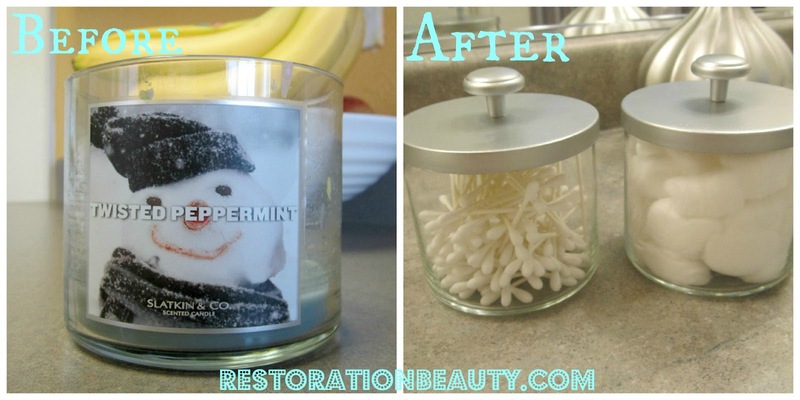 Today, I will show you the 2 ways I've repurposed my candle jars! The first is my favorite: As cotton and q-tip holders for the bathroom! All I did was clean out the jars (demonstrated towards end of this post), added some knobs to the lids and spray painted the knobs and lids with a silver metallic. After cleaning the jar, I just filled it with some pebbles to keep my brushes in place! And there's no need to do anything to the lid! 1. When your candle is all out of burning time, put it in the freezer overnight. 2. The next morning, take a butter knife and run it around the edges. The wax should come loose easily; but as you can see this wax in particular was a bit stubborn... I had to dig into the middle section of the wax for it to eventually come loose. Tip: If you have stubborn areas that won't give up the wax residue, simply take a cotton ball with some alcohol and rub away! This always does the trick for me! Now you have a clean jar to repurpose as you see fit! 1. You can store pasta or other dry goods. 3. You can use the smaller jars to store bobby pins or hair ties. 3. Craft storage for buttons, ribbons, pins..
And I'm sure you can think of so many more ways to use these! The possibilities are quite endless! What items do you like to repurpose?